Since our last post we departed the Sierra Nevada’s and headed back to the coast. After making a brief stop in Sacramento to replace the bug’s distributor which failed while driving in Yosemite valley, we spent the night at Standish Hicky State Park situated along Hwy. 101. 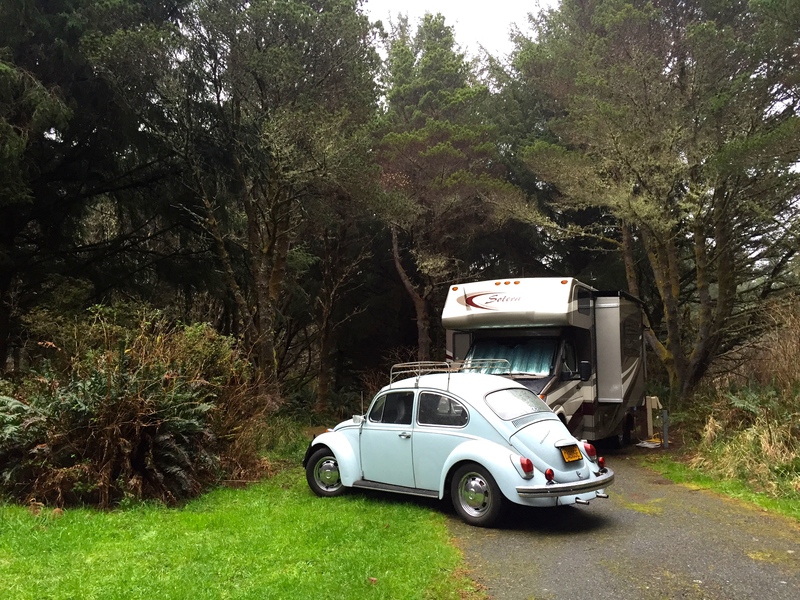 This beautifully lush campground along the South Fork of the Eel river is surrounded by giant cedars and pines. Other then driving the length of Hwy 395, Hwy 101 is our other favorite north/south road. 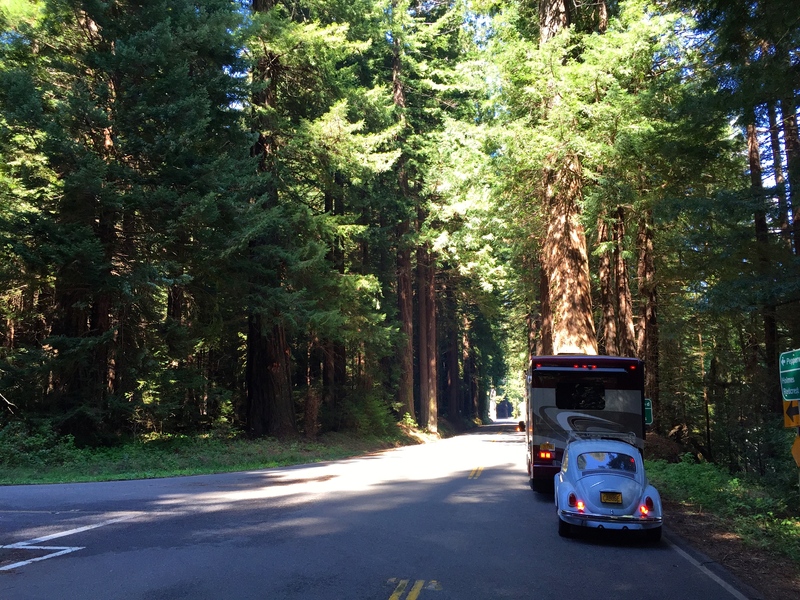 Even though we have driven through the Redwoods many times they never fail to amaze us. There is just something about being able to walk up and touch a living organism that is a thousand or more years old. While cruising the coast we encountered the usual precipitation this coast in known for but regardless we enjoyed driving the beautifully rugged coastline. 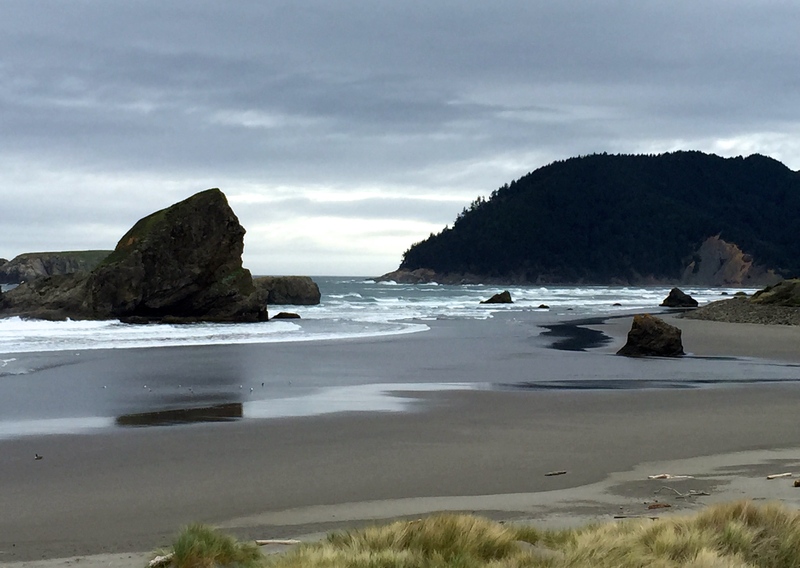 We spent nights at both Big Lagoon County Park in Northern Calif and Cape Blanco State Park in Southern Oregon where the pups enjoyed a romp on the beach dodging the waves and running in the sand. 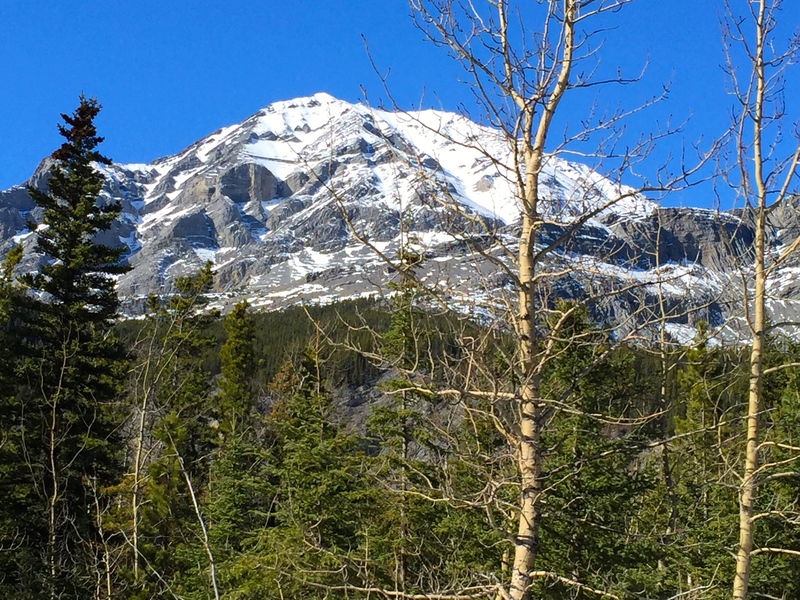 We had been closely monitoring the weather through Canada and along the Alaskan Hwy and noticed a moderate weather trend was forming for roughly 10 days in a row. 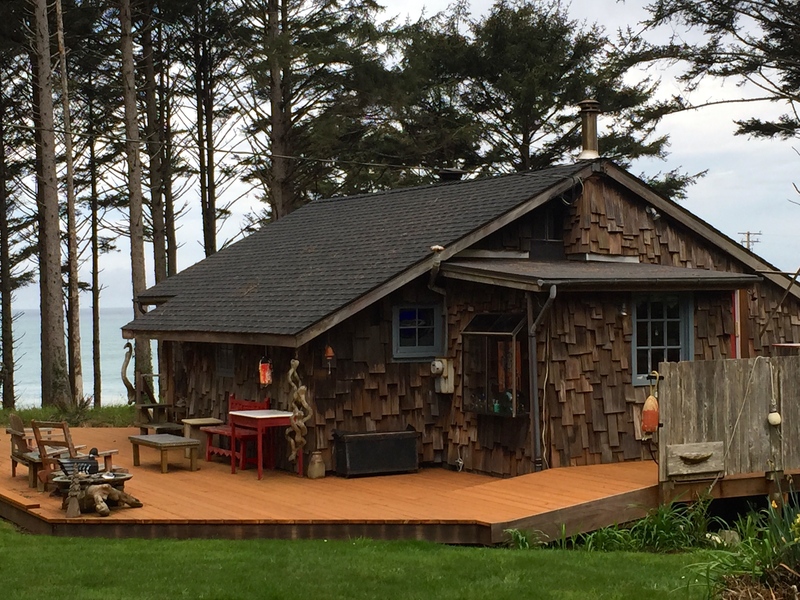 Somewhere in Washington state we made the decision to focus on utilizing this window and to head north. After obligatory stops at Costco and Trader Joe’s we crossed the border at Sumas. Once in Canada we passed through the beautiful town of Hope and entered the Frasier River Valley. Besides its amazing gold rush history the drive through this valley is in my opinion is one of the most scenic of all the Canadian Hwy’s. 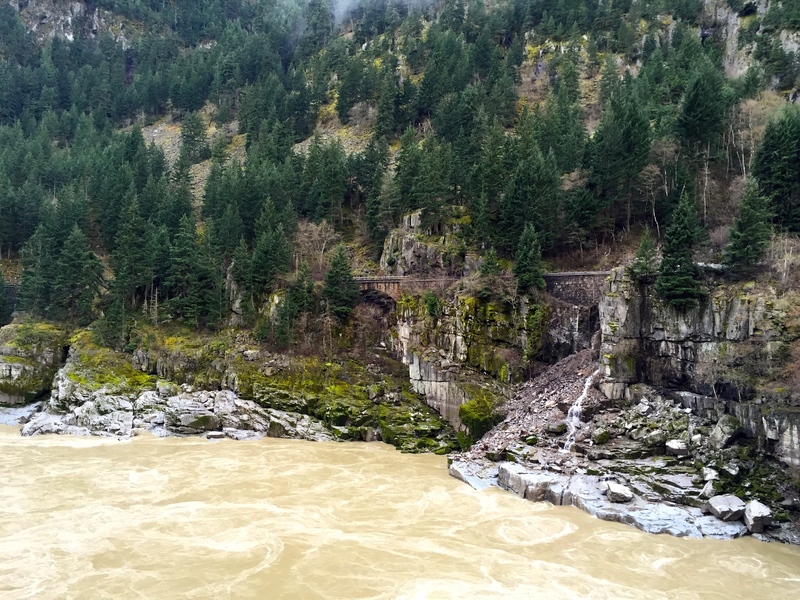 With railroad tracks along both sides of the canyon its no wonder the Rocky Mountaineer http://www.rockymountaineer.com/en_US/ follows this very scenic route. 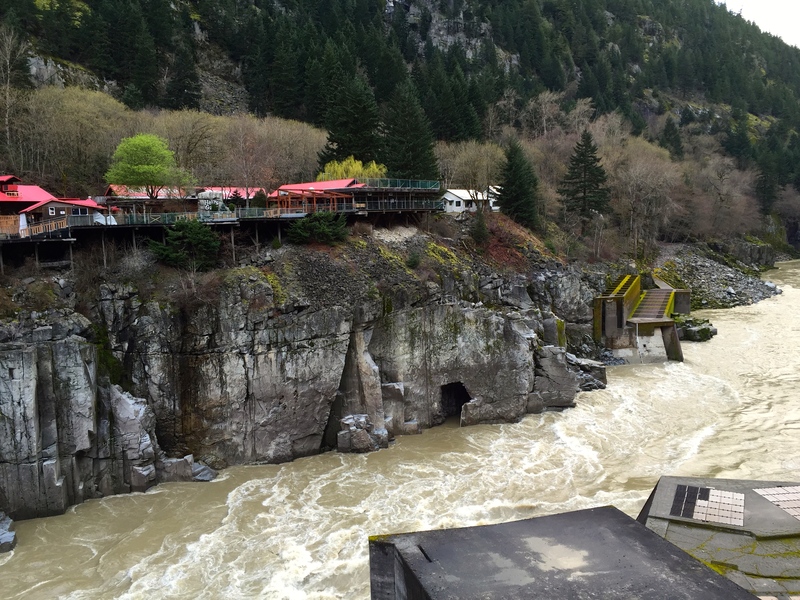 We found a great rest area about 500′ above the river at Hells Gate to spend the night. An access road leads down to the river and to the bottom of the Hells Gate gondola. With giant whirl pools and narrow rock walls LuLu and I enjoyed a steep morning hike. To stay within the good weather forecast we now needed to drive about 300-400 miles a day. This made for some long days in the seat but the remote and vast wilderness kept us entertained. 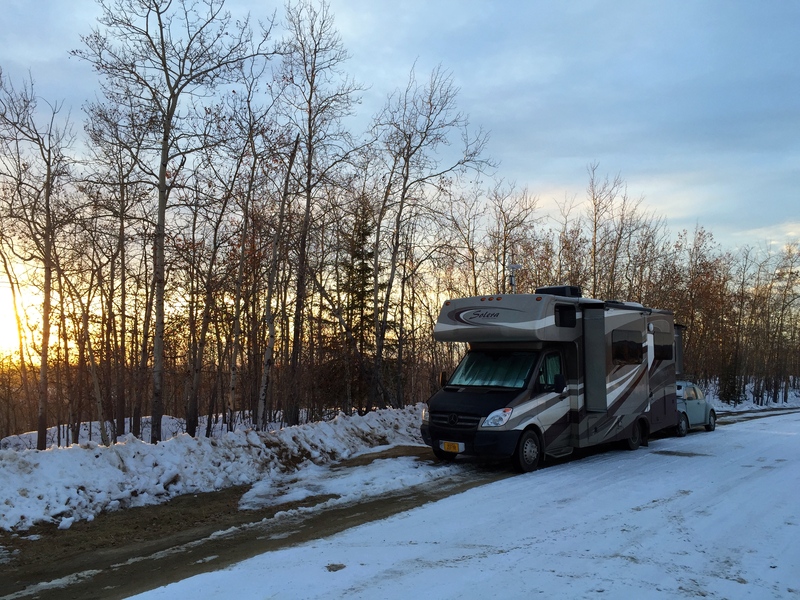 RV parks along the Alcan this time of year are typically closed but we were able to find one each night that provided us electrical hookup. This allowed us to run a small electrical heater and our propane furnace when needed. During this period we encountered temperatures varying from +50 during the day to +19 at night. The Zephyr is well insulated and we slept snuggly. The drive through British Columbia and the Yukon this time of year is a fantastic ride. The road was in great condition except for about 60 miles of rough dirt just north of Destruction Bay. The plus to driving north this time of year is that you are driving on a frozen road. The road eventually thaws and starts breaking up and can become very rough. As we passed into the Yukon it was essentially still winter with lakes and rivers still frozen and snow patches in the shade, but spring break-up is just around the corner. 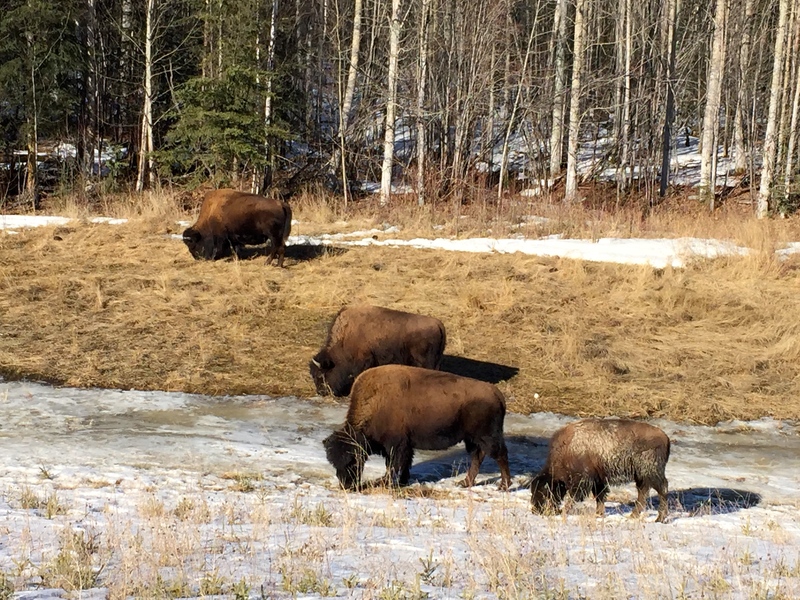 After 4 days on the Alcan we crossed back into Alaska and spent our final night near Northway. After a quick stop in Fairbanks to resupply we arrived back at Taylor Base Camp in Denali. To say the least it was GOOD to be home though the dogs are confused. They continue to run back to the motorhome when it is time for bed. 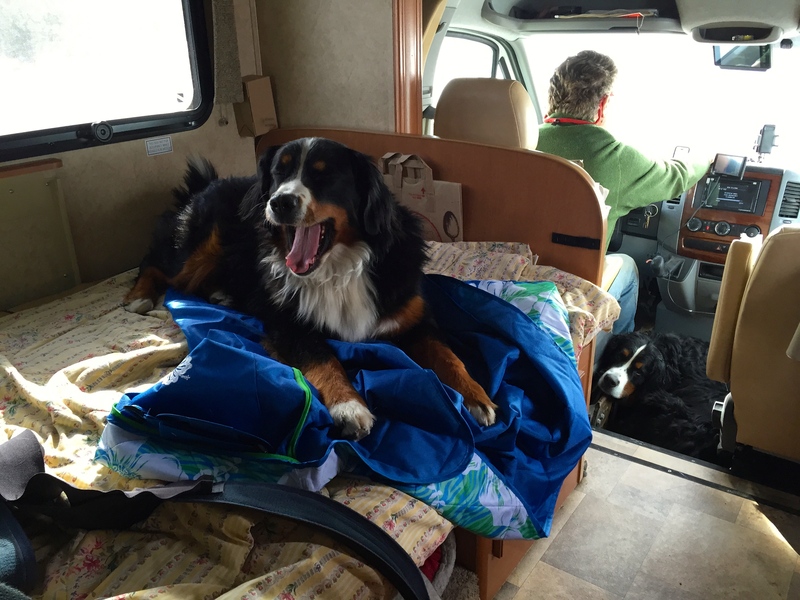 It was great traveling with them as they both loved being with us, smelling new places and barking at new people. But to be honest both Denise and I had reservations about coming home. It would have been very easy to stay on the road longer wandering to our hearts content, its a great lifestyle and one that we are both very happy to be doing again. Who knows someday we may become full timers but for now summers in Alaska are just what we need. Diesel fuel prices ranged from $7.00 per gallon in the Yukon to $2.46 in the Calif desert. 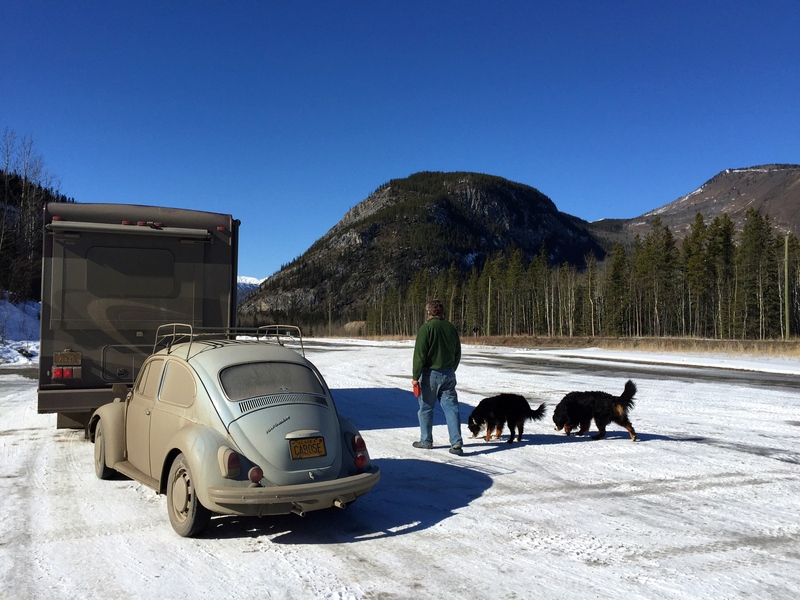 1969 VW bug was perfectly suited for towing and was utilized extensively. This ends our travel blogging for the winter of 2014/2015. We thank all who followed and commented on our travels this winter while enduring this burgeoning blog. I hope it kept family and friends updated, informed and entertained. I intend to continue posting every week or so during the summer months keeping everyone appraised of our summer exploits in Alaska. Then sometime in September our travels start all over again. If you are so inclined stay tuned! So from all of us… Thank You! Welcome home! Let’s get together sometime – I have shoulder surgery on Friday, will be staying close to home for a while after that.